I did this layout based on Dirk's schematic here. Now verified. Thank you for the wonderful circuit boards. Verified. Though while the transistors are laid out right (CBE), the diagram is opposite - flat side should be facing the right. The pulsing LED is cool, and using different ones will get you different rates/depths of effect. Great trem though. It's exactly what I was looking for. Actually, that's incorrect. Base side should always face left for Q4 (which is a 2N5088/9) as seen here. It doesn't really matter as long as the person knows what the CBE positions are for their transistors, which is something they should really check themselves. Great layout...... what is the switch on the right....anyone can explain? Thanks, it's a 2 position SPDT toggle switch. Oh incidentally, you could get away with just a SPST switch with only 2 lugs because one of the throws isn't being used. So if you can save a bit of cash go for the SPST. Thanks. But what does the switch do? and does this have 2 LEDs? One LED that is written only as LED to be soldered to the positive terminal of an LED to indicate effect on/off and another LED marked LED+ and LED- will indicate the LFO speed? Please explain. The LED is soldered between the + and -, and the LED Sw wire is taken straight to your switch and then to ground. Then when the effect is engaged the LED will pulse in time with the tremolo. The switch alternates between two rates, fast and slow. Ok I'm pretty sure the "LED Sw" goes to your usual LED Negative connection on the 3PDT footswitch (the proper on and off for the effect). So basically you wire the LED as appropriate with those two top connections with the grey and pink wire (as you have done in the image), then you wire the LED Sw connection to the 3PDT footswitch on the usual LED point. This will make the LED act as a pulse speed, and an on/off status indicator. What are the red squares in the board? The caps ar polarised, right? Electrolyts? Electrolytics or tantalums, whatever you can get. You'll see a light blue "-" sign on the negative side of the caps in the layout. I'm having some trouble understanding the 9V connection, and how it's wired to the input jack...or rather why it's wired that way. Could someone explain what happens when the 9V plug is connected, and when the input jack plug is connected... Is there a 9V battery in this circuit? Do you mean on Dirk's schematic? If so it's just showing the negative side of the battery (or supply) going to the sleeve of the input socket, and so a point of ground. All other points of ground will also be linked there but they're just not shown on the schematic. OK. Thanks. Do all ground points connect to the chassis/box, including the sleeve? Just finished this but it is not working, I am getting only bypass signal with a little less volume and more bass. What is wrong? On checking connectivity between parallel copper strips found everything ok; but between the two copper rails on the left of the Vero board where the Intensity Knob 2 wire and the Circuit Ground wire is jutting out The continuity function on the multimeter is giving a voltage reading but no beeps. The reading is 650. What is wrong? Any help. Well you must have some sort of bridge to the end rails which is obviously causing the problem. Send close up pic of the back of the board and I'll have a look. Sorry I've just re-read your description of the reading and think I got the wrong end of the stick before. Just post a front and back pic and I'll have a look to see if I can spot anything amiss. Spotted 2 wrong cuts, fixed them. Now the tremolo effect is working , but hardly one can make out it is infinitely subtle that also at the max setting of both knobs. The LED is also very Dimly blinking at the tremolo rate. But all this is happening only at the off position of the spst switch. On the on position nothing is there only bypass signal. any clues? I am mailing you some pics, the title of the mail would be swamp thang troubleshooting. Please see and suggest.Thanks. I'm looking at some photos of an actual Swamp Thang, and there are some differences...it seems to mee. But I'm no expert at figuring out circtuits. Feel free to email me if you want to see the photos, and/or help me understand the schematic..
Revisited this circuit and built it again. This time it works fine but the LED is hardly glowing. I used Ultrabright Blue LED still this result. Is the LED supposed to behave this way? Can I remove it or does it contribute to the sound of the effect? I just discovered that yellow and red LED is giving the slowest speed , while blue is a bit faster. So the LED is required, but how to make the LED glow brighter? Just finished this and with the intensity I am only getting about a millimetre of use from the sweep? literally, the entire sweep is within a millimetre of turning? I used B100k. Faulty pot? As no one else has mentioned it? It's definitely not right, can you measure the pot as you rotate between lugs 1 & 2 and then 2 & 3? It's easier to do this with crocodile clips or something that holds the probes in place. Put it in ohms mode (range to cover 100K) rotate the pot to one extreme then measure between lugs 1 & 2. Then watch how the resistance changes as you rotate the pot to the other extreme. It should be 100K at one side and 0K at the other. Measuring between lugs 2 and 3 should give you the opposite results, 0K at one side and 100K at the other. If the pot is dodgy the transistion may not be smooth, and/or the extreme values may be off. Well measurements were all over the place probably due to not being able to hold them in place very well so I just changed the pot with no change. At max I get full signal with no effect (vibrato) and I have to gently nudge it down to get the effect, it is silent past that point. Oh well nevermind. Another one for the sin bin! I had a wrong value in place of the 270k!! doh! BUT, on faster settings the LED stops blinking (turns off) I dropped the 470 ohm to a 330 to make it brighter. Could this be due to the LED? I'm using a green one to test it. Ok tried all colours and they all cut out as the speed increases. I there a way to just have a solid LED? Yes just do it as you normally would with any other effect. 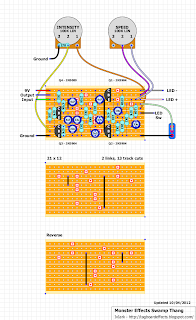 Take a feed from the 9V row with a resistor inline to the anode of the LED. Cathode to switch to ground. Ahh ok cool, so I can omit all the LED wires from board and the 470 resistor too? I thought the LED had some kind of influence on the effect..
Also, both pots are in reverse. The LED actually changes the slowest speed achievable, I found that yellow LED gives the slowest minimum speed, and Blue the fastest minimum speed. So what I have done is, in place of the LED wires I have board mounted the LEDs and taken the LED sw wire to ground. But as an indication LED I have put a solid LED. mine lights up and passes a signal, but it doesn't oscillate (nor does the LED). anyone want to measure voltages on their transistors? Just hooked this up to my test rig and it sounds beautiful....except there's a MASSIVE volume drop. I have to crank my amp to hear it. Again, sounds like it should -- LED works fine and so do the pots. It's just that the volume is almost nothing. Sounds like a bad connection somewhere. The difference between a fully working, great sounding effect and something like this is just one cold solder joint, or an unwanted bridge somewhere. More than likely it's a solder joint because an unwanted bridge would be more likely to cause more of an issue than just level. If you can't see anything suspect, just reflow the solder over everything to make sure all the connections are true, including the pots. And make sure all ground points look good too, maybe checking for continuity with a multimeter between all points of ground including offboard. Turns out I had one resistor off by one strip and it was dumping most of the volume to ground. Fixed it and I have beautiful tremolo. Sounds just as good as the one on my Deluxe Reverb Reissue. I'll try to record a clip. This one is definitely one for the tremolo fans! I boxed it up and the LED is on even in bypass. I think I have the wiring a tad mixed up. When you say the LED Sw goes to the switch and then to ground, do you mean the footswitch and then to ground? And refer to this offboard wiring guide, then the LED Sw wire goes to lug 1, with lug 2 making the connection to ground when the effect is turned on. If you ground that wire directly then the LED would indeed always be on. Just wanted to double check before I wired this up.....is this correct? have rewired as per offboard wiring guide - only problem the (GWG cable) RHS 4th strip down RHS now has no home - any ideas? can anyone tell me what size enclosure i need for this? Just built this... Great tremolo. What would I modify to make the speed go even slower ? Thanks for all the work on this ! should I get one switched and one unswitched socket pr input and output of the jacks ? Should both of them be mono ? I only use mono because I never use batteries, but use a stereo socket for the input if you want to use a battery. Thanks for your answer I really appreciate it :-) ! Concerning the kit are there other components to order other than the input and output sockets and wires ? Just to be sure. sort of Flashing 5mm LED ? And concerning the Box , is it better to get an aluminium box? or an ABS boxe is okay ? No, just a normal LED in the colour of your choice. I'd prefer an aluminium box, the shielding provided by the box should make the effects quieter. And thanks again Mark ! Just get the size you prefer, there is no technical reason to use one size over another other than your own preference. I prefer the LED to be small and so use 3mm one, but it's entirely up to you. Hello. 2n5089 can be replaced by BC547 or other? I have the wirdest thing with the led that i tought i could get some help with. Iv buildt 2 of this ones for my friends and one works just fine but the second one something must be wrong. All my leds dies or breaks after replacing them. The effect works fine exept everytime i put it on the led short and dies. to postetiv the volt is 1.16-1.35 and negativ is -0.00 and some times -0.10. The led gets the same amount of volt even if the pedal is on or off. Just finished this. Good sounding tremolo. Anyone building this be aware that the pots are backward in the layout (just switch the wires to lugs 1 and 3) and the pulsing led shuts off at full speed. Thanks iviark for the layout. Hi lvlark! Can I request for a mastortion? Man this pedal eats you alive! I finished this tremolo, it's great !! My build works perfectly (after reversing the pot wiring), but I'm getting a very dim LED which turns off at higher speeds. I've tried various LEDs with the same result (except for differing speeds). I've tried reducing the 470R and even jumered it, but there was little to no difference. I've triple checked the resistor values and the caps and they seem to be fine. Any suggestions? Just finished this as my first strip board project after many pcb based ones. I have no flashing LED and just a low level signal when on, bypass is fine. I have check all grounds and they're fine, and also made sure there's no continuity between tracks. Any ideas of what to check? 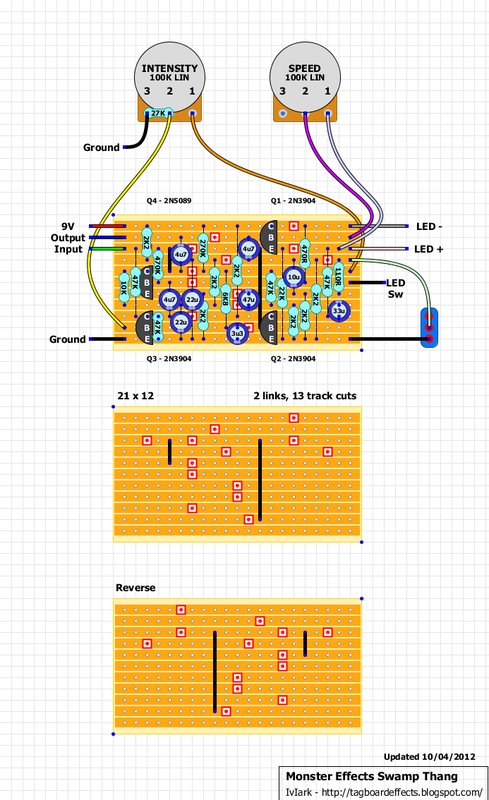 I used the off board wiring diagram for my wiring but just took the LED wire to the switch not to the 9v jack as well, is this correct? works great except LED stops when speed is turned up. any ideas? after watching a few videos the original swamp thang led shuts off at 4 oclock and on. cool pedal . i built one for a buddy. anyone thinking of building one swap lug one and lug three on both pots so when you turn clockwise speed and depth increase. the way it is now you have to turn them counter clockwise to increase. ThIS pedal has a slight volume drop but its really warm and vintage sounding. still havent figured out why led stops working past 4 oclock anyone? Hello, I've build the swamp thang and it works plus it sounds great BUT when I switch it on I get a POP which is getting quieter the more I switch it on and off. Now, sometimes it goes away and sometimes it stays. How could I fix it. I read thad the original sometimes has the same problem. Do I have to live with it? does anyone have a diagram for the footswitch? I'm not sure what connects to it, I have a feeling I connect all the components to it? Probably a really dumb question but I have never made one of these before. Hi, how to make the sound of the pedal more "bright"? for a brighter LED just solder it before the 47k resistor! could you make the mastortion from monster effects? Just a small correction, the layout is 21 to 11 not 12. Just built this. Nice trem! Not as good as the Demeter I used to own, but didn't want to risk building one of those as the parts are quite expensive (with the vactrol and all) and many people appear to be having clock noise problems with them. Anyway, this is close enough so I'm pretty happy with the way this one came out! Thanks for all the great layouts!